Biscuits are so delicious and SO easy to make! This recipe is one that has been in my family for a while and is definitely a keeper. 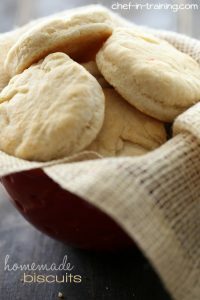 I tend to use can biscuits for a lot of recipes purely out of convenience, but forgot that it is really is almost just as quick to whip up this dough, plus it tastes WAY better than the can stuff. I promise you that! Nikki they look perfect and I have a carton of buttermilk that I need to use up...oh boy :) Pinned! Please if you can post some gluten, soya and lactose free biscuits ingredients. Thanks for your useful tips and cooperation. Bob's Red Mill just came out with a Gluten free flour you could use in place of the flour above. I won a bag to try out but it should be in stores soon I would think. It is call gluten free 1 to 1 baking flour. What is buttermilk and how many grams is 6 table spoons of butter? In response to Marwa there are 14 grams in 1 Tablespon of butter but you can just enter "baking conversions" in your search engine. Also, buttermilk is the slighly sour liquid that is left after churning butter. Ermeril Lagesse has an easy recipe for homemade buttermilk if you don't have access to it. Place 4 1/2 teaspoons (use the converter if you need to) of while vinegar or fresh lemon juice a glass measuring cup and add enough milk to make 1 cup of total liquid. Stir to combine and let stand 10-15 minutes. (The mixture will begin to curdle). Use now or cover and refrigerate until needed. Hope this helps. I make biscuits like these quite often. I think anyone can make a decent biscuit using the recipe on the back of a baking powder can. Then, in my experience, if you want those to die for biscuits, it takes a little experimenting and learning what your biscuit dough should look like and feel like before you put them in the oven. Just keep making them and you will have amazing biscuits. Does the buter need to be softened or room temp or melted ? I made biscuits tonight for the first time and my friend and I loved them. I was a little worked at first that I got the consistency wrong, but it turned out to be okay! I will be definitely be making these again someday soon. do you really mean 450 degrees and not 350? I don't think I've ever baked anything at that high a temperature so I'm just checking so I don't burn them!